Please make an offer, the owner has asked us to bring him an offer. Stepping aboard the Silverton 392 Motor Yacht I couldn't figure out how the builder had fit so much space into what is essentially a 39 by 14 foot hull. This boat has two full staterooms, both of which have heads with stall showers; a large two level saloon with separate dining and entertainment areas, and a comfortable galley. Lets not forget the great space available to you in the fly bridge, the open plan nature of the rear cockpit with multiple docking access doors, the huge swim platform and huge front deck area with amazing access directly from the fly bridge. Stepping through the Starboard side access door via the owners custom docking finger is an interesting way to board the boat directly onto the raised aft cockpit at around the height of an average fly bridge it offers a large uninterrupted entertaining area complete with a wet bar, icemaker and an extended hardtop overhead. The large Port side cabin door opens to an easy set of stairs down through the companion way to the saloon, the Starboard side offers moulded steps with grab rails up to the fly bridge. Heading aft further finds you wandering down another moulded staircase of 5 steps to the huge swim platform with Stainless railing for your BBQ. Plenty of room down there as well. Having had the luxury of spending time aboard a wide range of boats during my boating career I am surprised at the amount of room this 39 foot boats offers stepping down into the saloon ! Utilising the full width of the boat allows the entertainment area to remain uncluttered so your TV does not block any of your large windows allowing plenty of natural light to flood into the boat. Relax on a sizeable L shaped lounge to Starboard or fold it out and add a double berth to the sleep equation. Continuing forward and a small step down you arrive in the galley come dinning room. I cant call it a dinette, it does not do the space justice. A three burner gas stove with oven, bench space larger than my first apartment in Sydney, microwave and a stand up 249 lt Vitrifrigo fridge freezer. All this is surrounded by large windows and natural light. The forward berth is for your guests to relax in, an oversized queen berth, comfortable and with its own bathroom. Heading aft and down a set of carpeted stairs the name sake of this Silverton aft cabin takes up the last third of the boat with a large island berth at around queen size, a large ensuite, excellent head room for my 6 foot plus frame and great ventilation with a large opening porthole out onto the swim platform. If you are still feeling like you need some space to get away from the kids take the cockpit stairs to the fly bridge and relax on a full width helm lounge, there is room for at least 6 here or make your way forward down the staircase either side of the helm and realx on the forward deck. There is almost enough room here for a game of tennis with high Stainless rails it will be safe enough for the kids to relax when you are on the mooring. Powered by a pair of caterpillar 3116,325 Hp diesel engines with low hours from new she moves along with ease offering the best economy at around 16-17 knots according to the current owner and with quality electronics a long cruise is well within here reach. With the current owner looking to relocate we are urging interested parties to make contact with our office today. Take the initiative, call the R Marine Mandurah team today. Experience the R Marine Mandurah difference for yourself ! 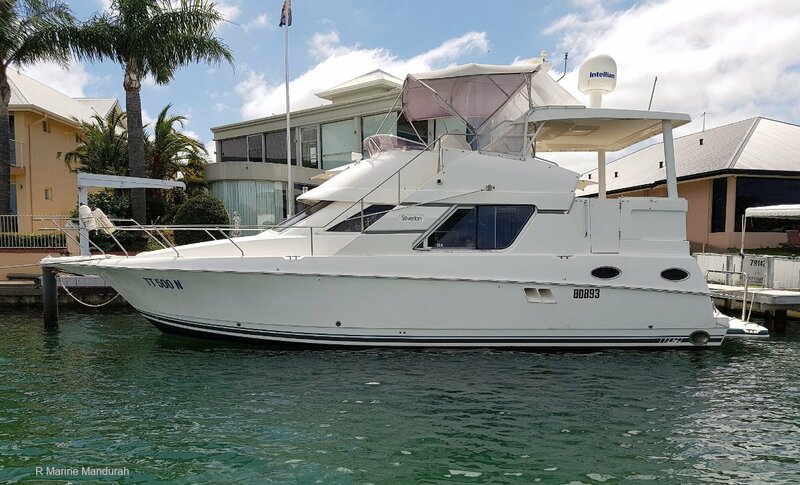 Call the office on 08 9583 5355, Paul on 0427 949 293 or Cruze on 0456 949 293, we are here to help and will be happy to arrange a suitable time to view this exciting boat. The galley is a U-shaped arrangement and features 2.18m headroom, a solid counter top, dual-voltage refrigerator, three burner stove-oven, faux-wood vinyl floor, and plenty of stowage for pots, pans, and the like (one cabinet has a built-in Lazy Susan). Clearly, the 392 was designed for more than just weekend cooking. The 392 offers two private double cabins at either end, both with en suite facilities and separate shower stalls! WOW. Both the guest stateroom forward and the owner's stateroom aft feature two hanging lockers (one full length), and the double berth aft is an island for complete walkaround access. The L Shaped Lounge also folds to a double berth as well! If you're looking for an aft-cabin cruiser, you'll be impressed by the 392's accommodations. This is one practical leisure boat.... Sure to impress the Friends and family!